Description: Claire Prescott is a sensible woman who believes in facts and figures, not fairy tales. But when she agrees to present a paper to a summer symposium at Oxford on her ailing sister's behalf, Claire finds herself thrown into an adventure with a gaggle of Jane Austen-loving women all on the lookout for their Mr. Darcy. Claire isn't looking for Mr. Anyone. She's been dating Neil -- a nice if a bit negligent -- sports fanatic. But when a tall, dark and dashing stranger crosses her path, will the staid Claire suddenly discover her inner romantic heroine? Her chance meeting with a mysterious woman who claims to have an early version of Austen's Pride and Prejudice -- in which Lizzie ends up with someone other than Fitzwilliam Darcy -- leads to an astounding discovery about the venerated author's own struggle to find the right hero for Lizzie Bennett. Neil's unexpected arrival in Oxford complicates Claire's journey to finding her own romantic lead. In Mr. Darcy Broke My Heart, we again return to jolly old England, this time with Claire Prescott, a heroine I both liked and felt sympathy for. Claire is a stand-in for her sister at a Pride and Prejudice symposium and she goes slightly under duress because, unlike ninety-nine percent of the female population, she doesn't get the appeal of Mr. Darcy. Quite naturally, she quickly begins understanding when a Mr. Darcy type ends up in the class. Sounds good, right? It gets better. Ms. Pattillo also throws in a mystery manuscript which may be Jane Austen's original version of Pride and Prejudice, known as First Impressions. Let's start with Claire. I'll quickly admit that I am one of the many, many women who swoon over Mr. Darcy (and most particularly Colin Firth as Mr. Darcy) but I did like having a P&P variation with a heroine who wasn't on board the Darcy train. Despite this most unusual characteristic (insert a Lady Catherine type sniff here), Claire was a likable heroine with relatable family and relationship issues. She has been a substitute mother for younger sister Missy, resulting in actions that have been detrimental to both of them and leading to resentments that will boil over during Claire's week at Oxford. Claire has also been in a relationship with Neil, who is steady and dependable but who hasn't set her on fire and given her that zing. Enter James, the fellow symposium attendee who awakens that zing in Claire and creates a multitude of issues for her, not the least of which is her belief that Mr. Darcy is nothing but a fantasy. James shares Claire's belief that Jane Austen . . . eh, just a writer and Pride and Prejudice is an overblown Regency version of a Harlequin romance. (Blasphemy!) These two bond and lead Claire to question Neil and their relationship. Perhaps my favorite part of the book was the mystery manuscript, complete with text of the supposed First Impressions. I loved it. It was an interesting and creative look at what may have been, had it not been Elizabeth and Darcy. Along with Martin, a symposium attendee very knowledgeable about Jane Austen, the owner of the manuscript, Harriet, was my favorite character. Even now, closing my eyes, I can vividly picture her cozy little English cottage, complete with an overstuffed sofa, many books, teapot and the ever-smiling Harriet. While Jane Austen and Pride and Prejudice were the basis of this story, Harriet and her cottage were the heart. I have read many Austen variations and I was pleased that I didn't see where Ms. Pattillo was going with this one. The resolutions for Claire and Missy, for Claire and Neil, for Claire and James and with the mystery manuscript felt natural, were cohesive and extremely satisfying. I enjoyed this book as much as I enjoyed Jane Austen Ruined My Life and will be heading off to purchase the third book in Ms. Pattillo's series. Mr. Darcy Broke My Heart is available at major booksellers. 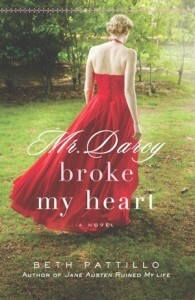 Find Mr. Darcy Broke My Heart on Goodreads. FTC Disclosure: The review copy of this book is owned by me and was won in a giveaway. The giveaway did not affect the outcome of my review. I was neither paid nor compensated for this review.